I first tasted rosewater several years ago at my stepdaughter’s first grade class party, which was thrown by a lovely Persian family. They served rose ice cream, a rich and creamy rose-flavored concoction that was absolutely heavenly. I’d come across rosewater many times in my vintage and historical cookbooks; it was one of the most common flavorings in Medieval England and Colonial America. Its early popularity in America waned as vanilla extract and other flavorings became more widespread, however rosewater remains a prominent flavoring in Persian, Indian and Middle Eastern cuisine. I’ve been wanting to create a dessert with rosewater for a few months now. Inspired by that first taste of rose ice cream, I was set on making something sweet and incorporating both rosewater and pistachios (another popular Persian ingredient). I originally tried this concept with brownies, but something about the flavor combination didn’t work for me. My genius assistant Ashley suggested we try it with blondies. The first try wasn’t quite right; it was missing some richness. I decided to brown the butter, which adds a nutty depth to the flavor, and I added some white chocolate chunks. The resulting tender, cookie-like blondies were rich, exotic, and completely irresistible. Top a warm blondie with a scoop of vanilla ice cream if you’re feeling totally decadent. Rosewater can be found at most Middle Eastern and kosher markets. If you’re having trouble locating or you’d rather not use it, feel free to substitute 1 1/4 tsp vanilla. But I really suggest you try the rose flavoring, it’s kind of magical. Have you ever cooked with rosewater? 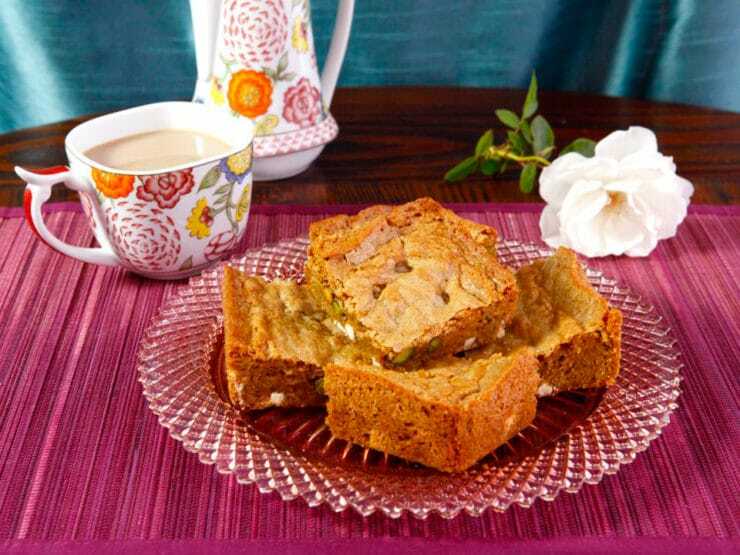 Pistachio Rose Blondies with White Chocolate and Browned Butter. Wow your friends with this easy, exotic and irresistible dessert recipe. Preheat oven to 325 degrees F. In a small saucepan, whisk the butter over medium heat until it turns golden brown and has a nutty aroma. Careful, don't let the butter burn. 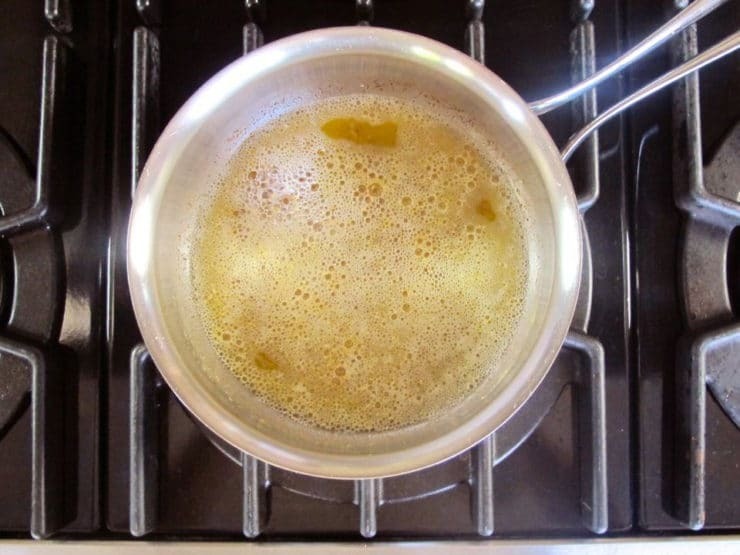 Remove from heat as soon as it's golden and place the pan on a cool surface. 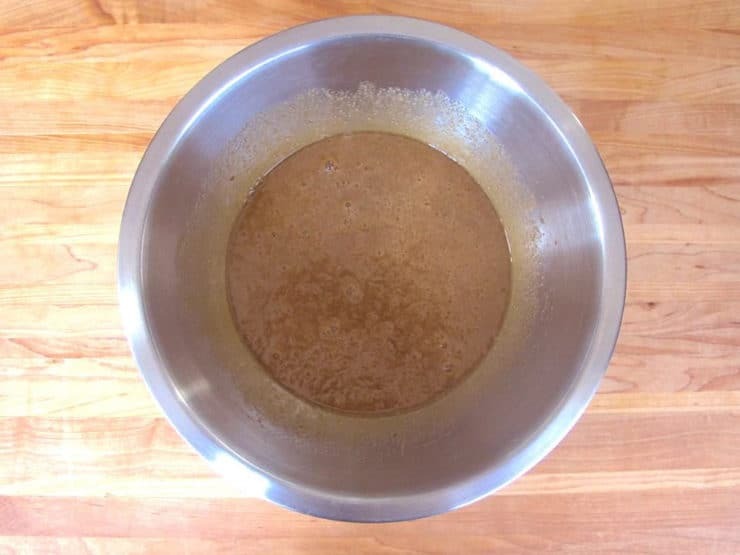 Once the browned butter has cooled, transfer to a mixing bowl and combine with the oil, brown sugar and eggs. Whisk till well combined. 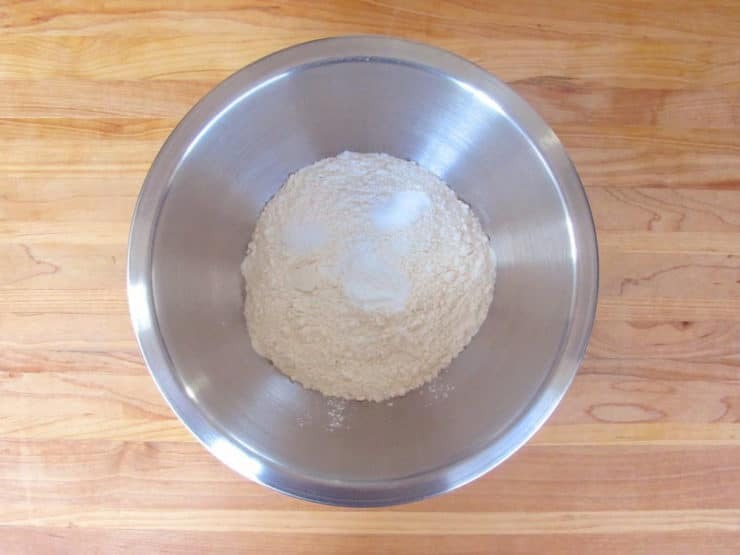 In a medium mixing bowl, combine the flour, baking powder, baking soda and salt. Combine thoroughly with a whisk. 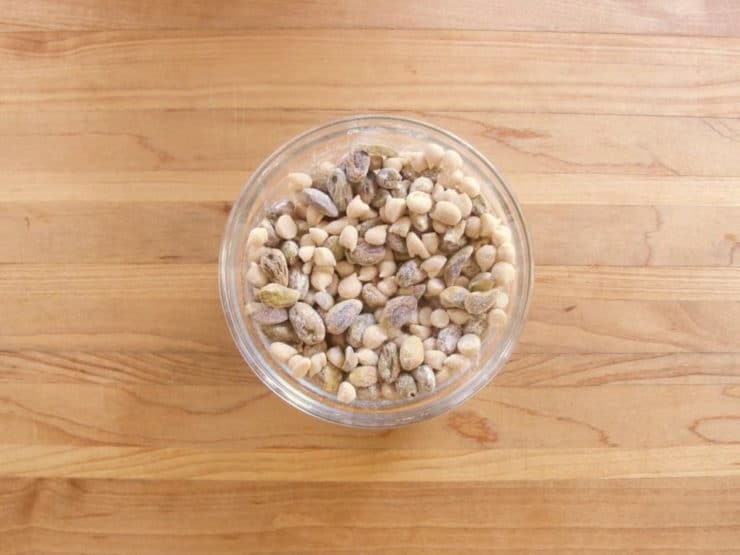 In a small bowl, toss the pistachios and white chocolate chips with some of the flour mixture. This will help prevent them from sinking to the bottom of the batter during baking. 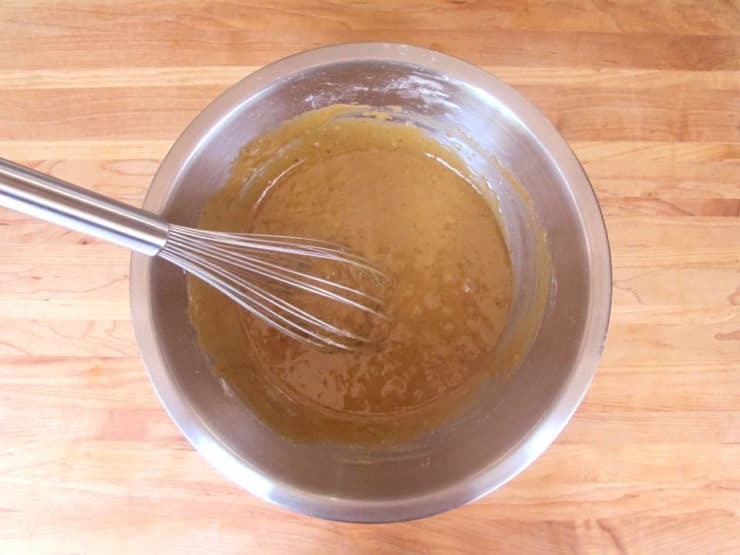 Add the flour mixture to the butter mixture along with the rosewater and mix very thoroughly. Fold in the floured pistachios and white chocolate chips, along with the flour they were tossed in. 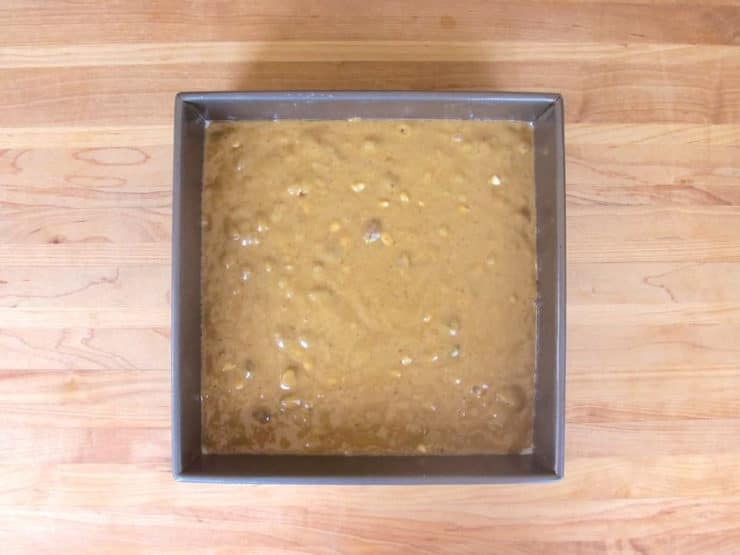 Grease a 9x9 inch baking pan with nonstick cooking spray and pour in the batter. 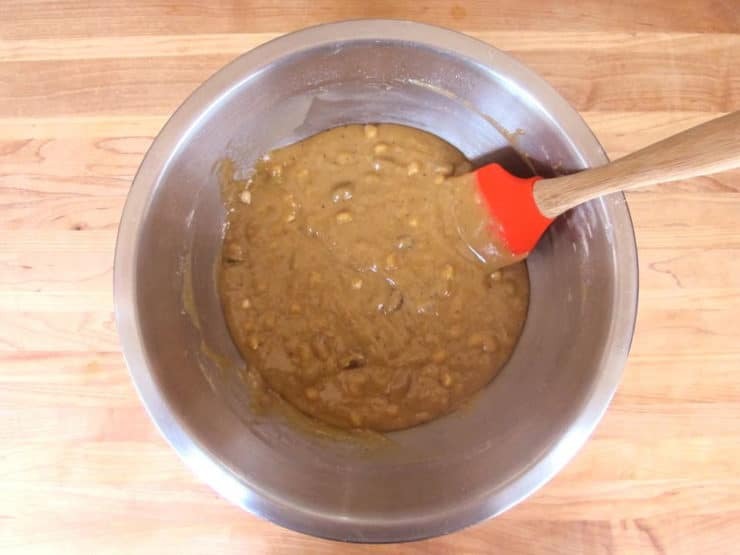 Bake for 25-30 minutes, or until the center of the blondies has set and a toothpick inserted in the middle comes out clean. Marks, Gil (2010). Encyclopedia of Jewish Food. Wiley. Hoboken, NJ. I can’t eat any kind of chocolate so I was thinking of using dried fruit instead, like apricots or cherries. Do you think that would work? made these yesterday, they are very good but i only used 1 tablespoon of rosewater and they were a bit to flowery….i think they would be better with only 1 tsp of rosewater which can be very overpowering. Did I miss your memorial tribute to the late great food historian Gil Marks, who passed away in 2014? I noticed you used him as a resource for this recipe. I had read that you were planning to write about him and the immense influence he has been on your work and on such fine writer-cooks as Claudia Roden. Please send me a link if you’ve already done this. Thank you. Love your work. Just made them! So delicious! I used dry roasted unsalted pistachios and ghirardelli white chocolate. Love rose water. Maybe I’ll use an extra tbsp next time. Yum! So happy you liked these Elian, they are a new favorite of mine as well. It’s a great recipe to bring along to a potluck! Thanks for something different to make, I will try it! I love rosewater and have made the India dessert of rice in milk with sugar and rosewater. I keep the rosewater in the refrigerator toward the back so it will stay fresh longer as that was the only recipe I bought it for. It is also used in the healing arts as a purification, sprayed in a mist over you. It’s heavenly. Our guests loved the blondies – they were exceptional with the semi-sweet chocolate. The rose water is a nice complement to the deep chocolate and the blondie batter. Thank you for reporting back Naomi! Tori-since you’re melting the butter in the recipe, can you use vegetable/canola oil instead? Thanks & love your blog! Hi Simone– yes, you can, however the flavor will suffer. Part of the thing that makes these so yummy is the browned butter. The oil will leave them tasting rather bland, in my opinion. Just made the blondies and they are baking away in the oven. The fragrance is divine. One change, I went with bittersweet chips (Scharffenberger) because I’m not fan of white chocolate. Correction — I meant semi-sweet chips, in addition to the pistachios. Let me know how you like them Naomi! 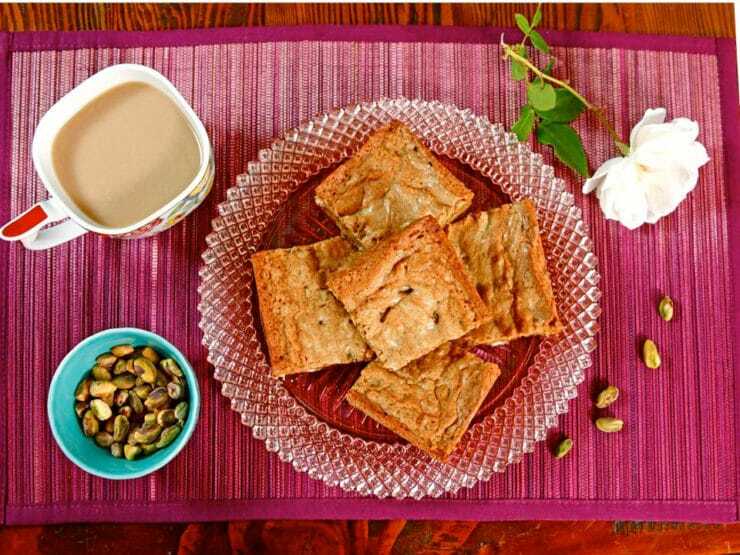 I love the rosewater flavoring in The Rebbetzin Chef’s Persian Walnut Cookies(@Allrecipes.com)-it elevates a good cookie to amazing….BTW they’re Pesachdik!!! and they’re great to make for Purim. These sound delicious. Can gluten free flour be used instead of wheat flour? Very much enjoy reading your recipes. Happy New Year, looking forward to more. Made these last night and they came out really good! I had no rose water but hope to next time. Definitely need to be careful with the vanilla extract — that stuff is powerful! My Tia (Sephardic for Aunt) was a related but not aunt. She used the rose water and her house always smelled of something delicious. I do recall that she claimed to use less sugar you add more extract. In the old days, eggs were sweet, and all the people in their nineties tell me that all the time. Tia is Spanish for aunt, used in Ladino as well. Tori-you must have read my mind-I just bought a bottle of rose water (& a bottle of orange blossom water) in an outdoor shuk here in Israel after eating malabi for the first time. Both “waters” smell divine! I can’t wait to try your recipe. Sounds delish! Hi Sherri, you can use margarine, but I would not recommend browning the margarine, since it lacks the milk solids that produce the browned butter flavor. Just melt it and add it to the batter, rather than browning it. If you love pistachio things, try Thin Addictives – the pistachio & almond ones are my favorite, but they are not available in Michigan so I STOCK UP when I am in FL Costco! I have used it in a cookie recipe purported to be from Egypt. Delicious and very different. In Middle Eastern restaurants I’ve had it in various desserts including ice cream and baklava. Love it! Recently I tried to find some but couldn’t. Yes, but did not like the combination with w/g free flour. Have you had luck with this combination? I have not tried it myself in this recipe, though I have had luck with subbing King Arthur GF all purpose flour in a variety of baked goods similar to this one. You mean the flavor of the rosewater clashed with the flavor of the GF flour? Lovely recipe! Will try for a sweet fete I am having in January! Thank you Tori! Absolutely, I’ve used both orange and rose water in Middle Eastern dishes. I’ve never cooked with rosewater, but I’ve made rose petal pancakes. Those cookies look yummy! My mother always had rosewater and orange blossom essence in our kitchen growing up. She always sprinkled it over fruit salad. I love the flavors and the combination sounds delicious in this recipe! Yes, but not for decades now. Yummy! No but i bought it its sitting in my closet waiting to be used ! My sister makes baklava with rose and orange water. I think. But me no. I think we are going to try these really soon. Hi Hila 🙂 I don’t recommend subbing straight almond flour in baked goods unless the recipe has been tested, it’s really hit or miss. Best to use a GF baking substitute flour like King Arthur GF All Purpose. Vanilla is a fine sub, I’ve given the recommended amount in the recipe intro. Peanut butter chips will work fine if you’re not using rosewater– if you’re using rosewater, they’ll clash with the flavor. If using PB chips, I’d omit the pistachios and double the amount of chips. Hope that helps! Excellent! I might have to find a recipe for peanut butter chip cookies with almond flour right about now (hehe), but once I get some GF all purpose flour I’m going to get on this recipe! Thanks for the tips! While we’re on the subject, I just want to say that I haven’t tried the GF flour in this recipe myself, though I have used it in similar simple baked goods with success (not so much with breads, but it tends to be a good sub in blondies, brownies, cookies, etc.). It will be an experiment, so if you try it please report back and let us know how it went! I sprinkle rose water over the cut up cherry tomatoes and slowly roast them. Then add them to diff salads, make crostini with them or just serve them as is. I never cooked with rose water, but my mother used to make a liquor with that and edible rose petals, it was sweet and tasted of roses! Where do you get rosewater? Yes, after I saw the movie “Like Water For Chocolate”, but haven’t done so in a few years. Rosewater is also very refreshing misted onto the face, especially during these cold winter days of dry air in the house. Great idea Bobbie! I’m going to fill a mister right this minute. A very strong memory of my dear grandmother (b. 1897) is her lovely fragrance. She treated her skin with glycerine and rosewater daily, and always smelled wonderful. I am Israeli and my dad is Egyptian , rose water is an essential ingredient in my kitchen , from biscotti to fruit salad ! Love it ! Rosewater was a staple at our house, also Orange blossom water. This and your Rum Raisin Cranberry Kugel are the only 2 recipes hanging on my fridge right now!!! Mmmm….thank you!! You are my sous – chef in shining armor. How did you know? Perfect for my New Years Eve catering gig, cut into small bite-sized squares. No, but I’ve always wanted to! Weekend baking project!